"Many Iraqi political and religious leaders have rightly condemned these atrocities," said Sarah Whitson, executive director of the New York-based watchdog's Middle East and North Africa division. They recognise that there can be no justification for this wanton killing of civilians," Ms Whitson said. Even though Iraq has been illegally struck with pre-emptive strikes on their sovereignty, invaded and occupied by the Coalition of the Killing who have committed genocide, maimed, imprisoned and tortured the Iraqi people. So who does the New York based watchdog work for? The CIA! The group cited a recent wave of, [alleged], "insurgent", [? resistance, ? false flag], violence but never stated which group has attacked. Sure they blame it on "insurgents" in which four Iraqi aid workers were stabbed to death near Najaf and 11 civilians were killed in coordinated attacks on five churches in Baghdad and Mosul. But how do they know that it is not a false flag by the US? Trying to instigate a civil war and blaming it on alleged insurgents? What about the resistance to occupation, genocide and torture committed by the Coalition of the Killing forces? So were they the 'US resistance or the US itself' who have attacked? Seems unclear unless they have some form of evidence. 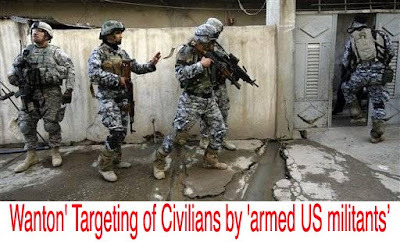 Civil wars created by the USA save military hardware and get them to kill each other? The fact that everyone in Iraq who disproves of occupation, genocide, maiming and torture is and insurgent rebel is nonsense. In reality Iraq has been occupied and treated like the enemy and that seems to have had no bearing on the intelligence of Human Rights Watch - even though Iraqi's may have formed the view that the Coalition of the Killing are in fact their enemies and that, [war criminals], George Bush, Tony Blair and John Howard are in fact Terrorists. Nevertheless the group cited a recent wave of violence. "Iraqis have suffered brutality for far too long," said Ms Whitson. "They deserve a clear break from this arbitrary violence." What, before the illegal war on Iraq? Since the illegal war on Iraq? Or after the illegal occupation, genocide, maiming and torture of the Iraqi people? Sounds like Ms Whitson has a vague memory! The attacks on such "soft targets" has created a climate in which many Iraqis are unwilling to speak out for fear of becoming targets themselves, she said.